Is your man cave due for a refresh? Are you planning on making 2019 the year you finally get the man sanctuary you have always dreamed of? If you answered “yes,” to either of these questions, this blog post is for you. Today we’re talking 5 man cave trends to watch for in 2019. Don’t let the word “trend” throw you off. The ideas below aren’t fads that will become outdated in a year’s time – this is the next wave of modern man caves. 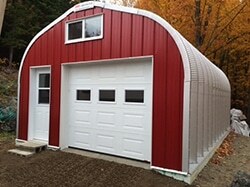 You put a lot of thought into how big your man cave garage needs to be, which type of insulation to choose, and how to furnish it, but why stop there? The exterior says just as much about you and your style as the interior. In 2019, man caves are not a new concept; however, there are some finer points that many still don’t fully understand. One misconception we often hear: “It’s nearly impossible to make a man cave garage look attractive on the outside.” This could not be further from the truth. There are many accessories that enable you to customize the exterior, including man doors, windows, skylights, and coloured end walls. This year, we predict that more man cave dwellers will not only take advantage of these accessories, but also take it a step further. We anticipate an increase in uniquely coloured vinyl and/or aluminum siding on end walls, siding that looks organic (like it’s made of wood or stone), and greater emphasis on smaller decorative touches like window shudders and lighting fixtures. A mini fridge is a man cave must-have, and this year, we expect to see more appliances added to create a true snack bar area. Think toaster ovens, hot plates, compact deep fryers, and electric grills. It’s not only a matter of convenience, it’s also a great option for the man who loves to host his friends. Keep in mind that using certain kitchen appliances inside your man cave garage may warrant adding extra ventilation. One way to tap into the sun’s natural mood-boosting effects while inside your man cave garage is to install skylights and windows that allow natural light to pour in. Or, try placing your pool table or pinball machine – or whichever toy you use often – inside, next to your sliding doors or roll-up door. Open the door(s) the next time you play to let the warm breeze and sunshine in. Nowadays, nearly anything can be done with the touch of a button or voice activation. Increase stereo volume? Check. Dim the lights? Check. Adjust the temperature? Check. For the man who is interested in the pinnacle of convenience, or is tech-obsessed, home automation is the new man cave essential. There are so many platforms and devices available that allow you to connect and control various aspects of your man cave. Attractive, functional storage solutions are always in style, but 2019 will be the year of hyper organization. Every toy and tool must have a home. Cabinets will contain labelled storage bins, remote controls and gaming equipment will be stored in ottomans, slat walls and wall racks will showcase bicycles, tools, and sports equipment. It’s all about maximizing space in a visually appealing way. Which man cave trends do you expect to see in 2019? Are there any ideas on this list that you’ve applied to your man sanctuary, or plan to? Let us know by reaching out to us on Facebook, Instagram, or Twitter!